Sign up for Broadjam today to follow Watson and Calhoun, and be notified when they upload new stuff or update their news! Acoustic duo from the Outer Banks of NC. 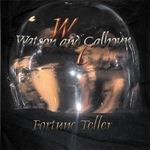 Fortune Teller The Debut album of Watson and Calhoun Acoustic duo from the Outer Banks of NC. Blends Acoustic Guitar with hand percussion and pure vocal harmonies of 2 talented musicians. Recorded Live at the Ranch in Kill Devil Hills, NC.